We've all seen over the top weddings on the big screen. From the veereys who dressed to impress to sangeet performances in films like Hum Sath Sath Hai where the bride is taken through all the ongoings of the household in an extra AF orientation dance. But the big, fat desi shaadi in real life too is just as big. From dancing to decor to it being a five-day affair, we don't leave any stone unturned. And it's just the same when it comes to weddings in Pakistan! 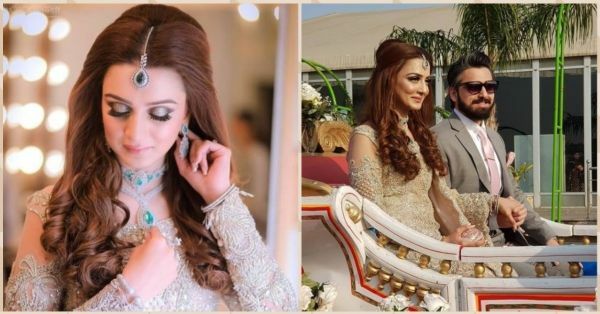 We came across this Pakistani wedding that looks every bit like a Bolly film set. Don't believe us? You've got to see the photos! Hubby and Wifey or Bajirao and Mastani? Firstly, the couple, Awais and Alina essayed the role of the hero-heroin with such perfection. Our dulhaniya looked gorgeous in her wedding avataar with all that makeup, jewellery and that stunning ensemble. Well, needless to say, the groom looked dapper too. She wore a teal, orange and pink lehenga with gold work for her pre-wedding function. She put on a choker and matha patti to complete the entire look. In keeping with the vibrant theme, Awais also wore a beige kurta pyjama with an orange Nehru jacket. For the main D-day, the swanky duo made their grand entrance on a horse-drawn chariot. Yes, Prince Charming vibes! And guess who was their best man?! Their baby pug, that's who! Also, is there ANYTHING cuter than a dog tuxedo? Not in a million years! And for one of the functions, Alina even wore a bright red sharara and dazzled the night away. There was gold zari work detailing along with green threadwork paired with emerald and kundan jewellery. Also, you can't miss out on that dramatic, floral bun! Which shaadi is complete without going all-out on the dance floor? Sangeet performances with your friends is a freakin' must! They danced on Bolly songs like London Thumakda, Muquaballa, and so many more songs and we can't help but sway along. Also, this bride-chilla taking over! Yes, please! Wasn't the wedding beyond gorgeous!? We loved every bit of it! Sending our love to Alina and Awais, may your smiles last a lifetime.